Ruins of architecture help to distinguish historic landscape architecture from organic terrain that may or may not have been influenced by human designs. Masonry is perhaps the most enduring milestone when it comes to lasting remnants of changes we have made to our landscape. Plants, animals, and soils are more organic and form-shifting. Organic elements of landscape designs change annually as their elements grow, die, or move. Keeping a landscape design controlled even to the desired proportions is virtually impossible. Plants are almost always too small, too big, or in the wrong spot. Trees provide the most for us: shade, nuts, berries, shelter, shade, fuel, etc… but they are also capable of great destruction as well if trunks or branches fall upon animals or architecture. An understanding of relative growth proportions in the environment can go a long way towards ease of maintenance. Most Americans know Thomas Jefferson as a Founding Father first, and second as architect and politician; but few know of his feelings and designs towards Landscape. Landscape designers were called “Master Gardeners” or “Landscape Gardeners” back then. We know from his writings that his primary influences were English Gardens and Classical Architecture. He was well versed in contemporary French and English literature and philosophy, and experienced various landscapes during his travels. Thomas Jefferson never fully accepted any one style or tradition. Although he was familiar with the Colonial mundane rectangular yard gardens, he was always innovating new hybrid ideas. Jefferson’s accumulated knowledge of surveying, architecture, climate, plants, and soil gave him tools beyond most other landscape gardeners. 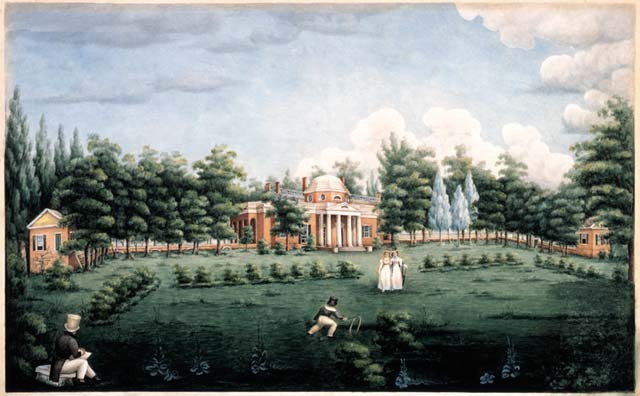 Jefferson’s approach to landscape design included both ornamental and utilitarian concepts regarding species, form, and layout. As a child, Jefferson was home schooled in ancient literature and classical music. Learning also took place out-of-doors and so he came to love nature with infinite fascination. Jefferson developed his knowledge of the natural environment from first hand experience as well as books. In 1760 he attended the College of William and Mary in Williamsburg, where he founded a secret burlesque society known as the “Flat Hats” with a group of friends. Jefferson became a devotee of improving American design with an open mind to World designs, and the natural environment of each site. He believed in contour plowing, as designing with nature was beautiful and practical. As he began traveling he embraced Palladian Architecture. These influences are evident later in his home, Monticello, when we see the geometric architecture combined with organic landscaping. According to his “Garden Book”, he was able to bud-graft cherry trees, and started planting at Monticello 2 years before be began building the house. During this time he was also practicing law (represented 68 cases). In his gardens he planted forwardest peas, midling peas, asparagus, strawberries, purple hyacinth, narcissus, carnations, Indian pink, marygold, globe amaranth, auricular, double balsam, tricolor, Dutch velvet, sensitives, cockscomb, Prince’s feather, lathyrus, lilac, Spanish broom, umbrella, laurel, almond trees, muscle plumb trees, and Cayenne pepper. 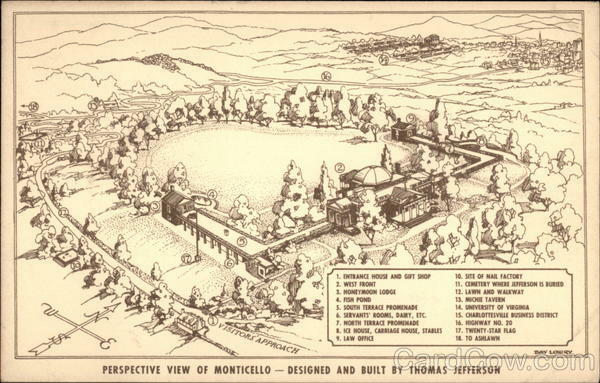 Monticello means “small mountain”. He fit it upon a terraced hill with rectangular and serpentine designs. In his notes he showed plans for garden olitory, pleasure grounds, spirals, and curves. 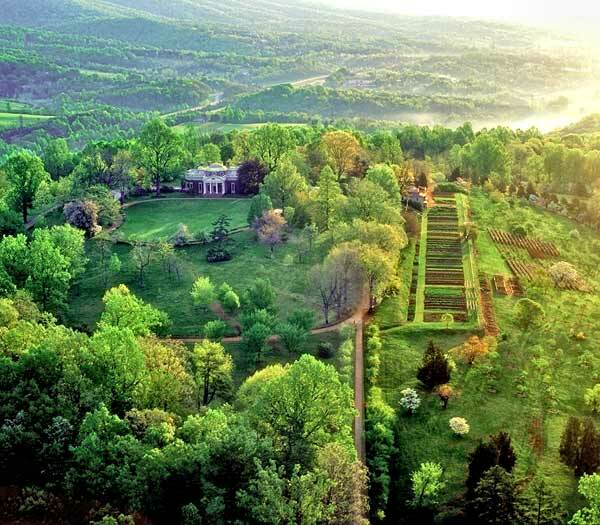 Both Monticello and University of Virginia have a “temple” with colonnades that embrace a courtyard. The Monticello courtyard is Egg shaped because of the paths and hill, although both cloisters are rectangular. Some conclusions can be drawn about the study and practice of Thomas Jefferson’s landscape architecture. Nature is a contractor for landscape architecture, because plant production in landscape was like human production in buildings. Designs are judged by their “finished product”; so in landscape architecture, products include flowers, fruits, and vegetables. His preferred building block was brick, but he made exceptions for wood and earth. He built several pise’ (mud packed in wooden forms) with General John Cocke at Bremo plantation. Jefferson believed that log and chinking was better insulated than scantling (wood frame) and plank siding. He believed it was foolish to ignore foods that grow easily nearby. “Useful” was his most used word. Thomas Jefferson died in 1826, and it was not until 1899 that Landscape Architecture was considered a profession by society. His only complete book “Notes on the State of Virginia” remains one of the most comprehensive observations of natural environmental conditions. This entry was posted on March 1, 2011 at 12:49 am and is filed under Arts (Design & Performance), Book Reports, Historic Architecture, Nature Studies, Organic Gardens with tags architecture, designs, father, founding, garden, gardener, gardens, house, jefferson, Land, landscape, monticello, organic, SCOD, serpentine, thomas. You can follow any responses to this entry through the RSS 2.0 feed. You can skip to the end and leave a response. Pinging is currently not allowed.